I’ve written before about how one of the recurring myths following the Great Recession has been that recovery in the labor market has lagged because workers don’t have the right skills. The figure below, which shows the number of unemployed workers and the number of job openings in February by industry, is the best way to rebut this idea. If today’s labor market woes were the result of skills shortages or mismatches, we would expect to see some sectors where there are significantly more unemployed workers than job openings, and others where there are significantly more job openings than unemployed workers. 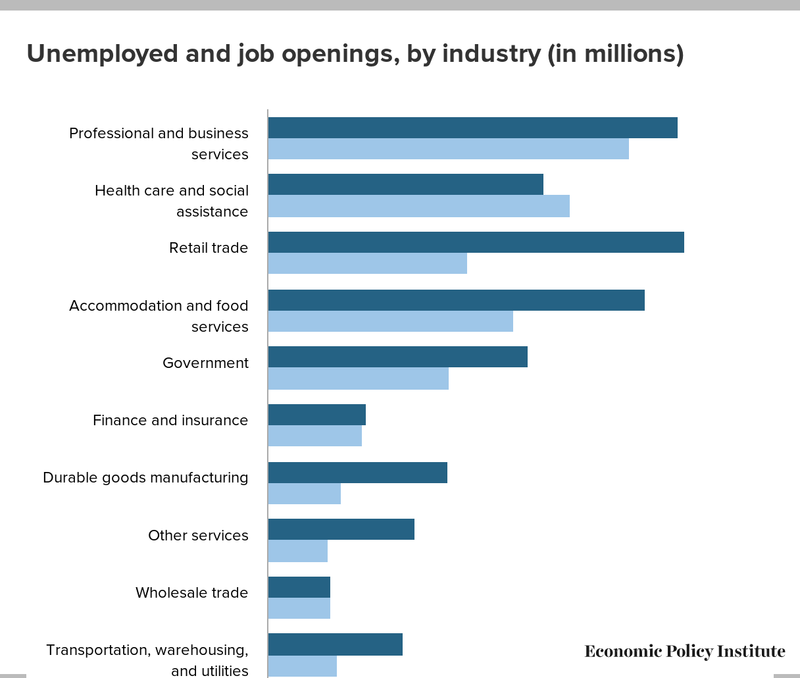 What we find when looking at the data is that there are more unemployed workers than jobs openings in most industries. Last year, the graph showed that the number of unemployed workers exceeded job openings in all industries, but there have been some signs of tightening in February. For several months now, health care and social assistance was the only sector where those workers appeared to be facing a tighter labor market. Now, it appears that they are not alone: finance and insurance and wholesale trade both have job seekers and job openings close to on par with each other. This within-sector tightening is a small sign of good news in February’s JOLTS report. Unfortunately, other sectors have seen little-to-no improvement in their job-seekers-to-job-openings ratios. There are, for example, still five-and-a-half unemployed construction workers for every job opening. In other words, despite claims from some employers, there is no shortage of construction workers. In fact, while the market does appear to be improving for some types of unemployed workers, there are no significant worker shortages anywhere in the economy. Taken as a whole, these numbers demonstrate that the main problem in the labor market is a broad-based lack of demand for workers—not available workers lacking the skills needed for the sectors with job openings. Note: Because the data are not seasonally adjusted, these are 12-month averages, March 2014–February 2015.